Now, you could totally turn this filling into tacos. Nothing stopping you at all. I just tend to try to limit my bread and carbs at breakfast or brunch (Crazy, I know) so I skipped the tortillas. 1. Heat oil in pan over medium heat. Add pork and cook, stirring crumble, until almost cooked through. Add onion, garlic, chili powder, achiote, salt, chipotle pepper and pineapple juice. Stir well and cook for 2-3 minutes. 2. Add sweet potato and 1/4 water to a bowl. Microwave for 5 minutes to partially cook them. Drain and transfer to pan with pork. Simmer until potatoes are fork tender. 3. Remove from heat and stir in pineapple chunks and cilantro. 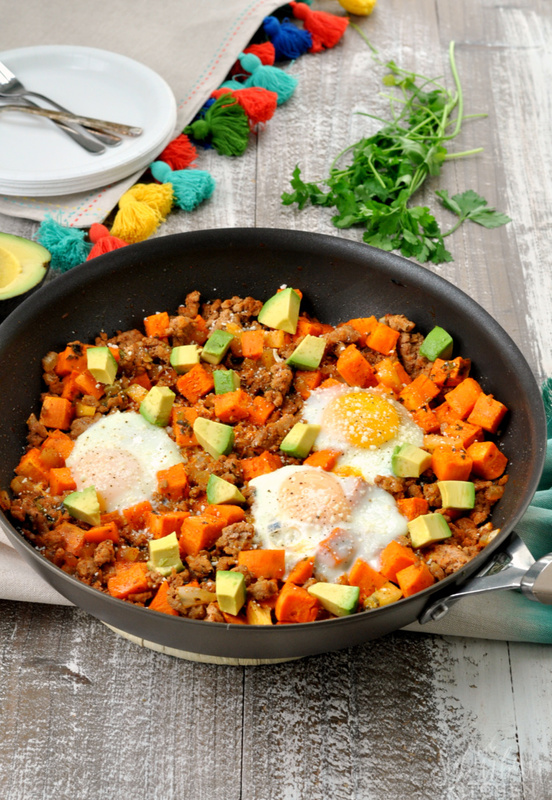 Top with fried eggs and diced avocado before serving. Note: Achiote is also referred to annato. It comes in both paste and powder form. This recipe uses the powder form. I find it in the Mexican aisle at our local grocery store. What are some of your favorite brunch recipes? Do you prefer savory or sweet in the mornings? Heat oil in pan over medium heat. Add pork and cook, stirring crumble, until almost cooked through. Add onion, garlic, chili powder, achiote, salt, chipotle pepper and pineapple juice. Stir well and cook for 2-3 minutes. Add sweet potato and 1/4 water to a bowl. Microwave for 5 minutes to partially cook them. Drain and transfer to pan with pork. Simmer until potatoes are fork tender. Remove from heat and stir in pineapple chunks and cilantro. Top with fried eggs and diced avocado before serving. 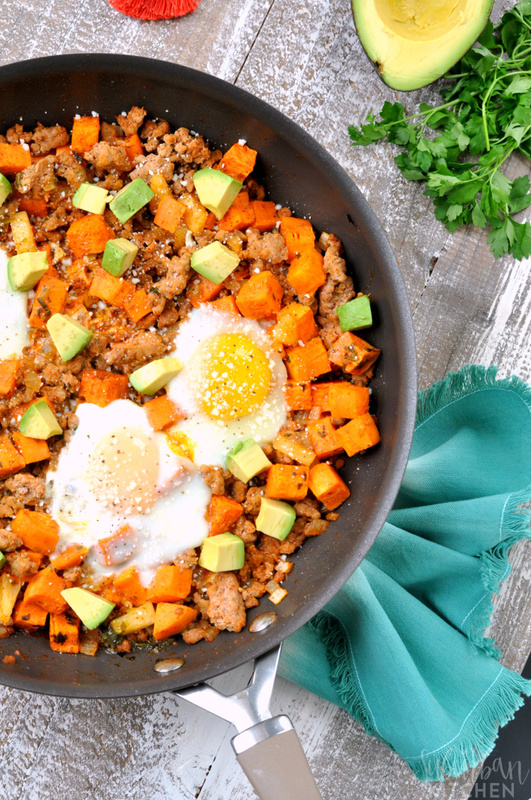 Another great sweet potato breakfast, I love it! 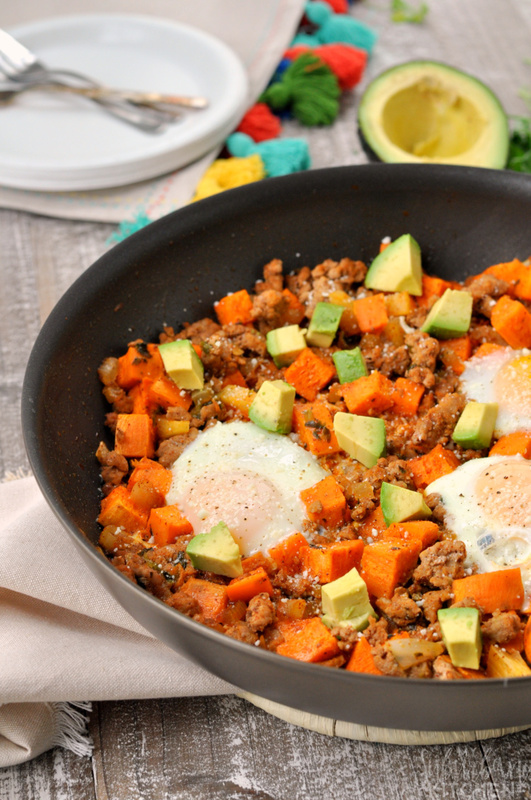 What an awesome breakfast hash! Pineapple juice is such a great idea. This hash has a great mix of flavors!